Umeå’s Capital of Culture year was characterized by openness, co-creation and dialogue – and it provided many opportunities for people to participate and make their own mark. The Cultural Boost was an opportunity for associations and independent actors to apply for a grant of up to SEK 20 014 to organize projects and events during the European Capital of Culture year. In the Glass House, situated at the Town Hall Square in the centre of Umeå, associations and cultural actors could showcase and market their business free of cost, with for example music, theater, dance, exhibitions and workshops. Many events that took place during the year had great help from volunteers and ambassadors. The programme remained open up to and throughout 2014. 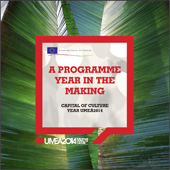 All projects related to the goals of the Capital of Culture year were invited to be a part of the programme – whether or not they were co-financed by Umeå2014. Through social media, visitors could with simple and useful tools contribute content in the form of comments and pictures. Businesses and partners could choose to support specific events, projects, themes or any of the eight seasons. They could also work with a specific cultural operator or carry out cultural initiatives in their own organisation.